Yesterday, I stopped by the Shack not only for a little taste of their Horchata Custard-more on that later-but also to see about the upcoming Shacktoberfest aka the official beginning of fall. Brownie and I have been fans for years, and were a little concerned that not a word had been heard about this year. 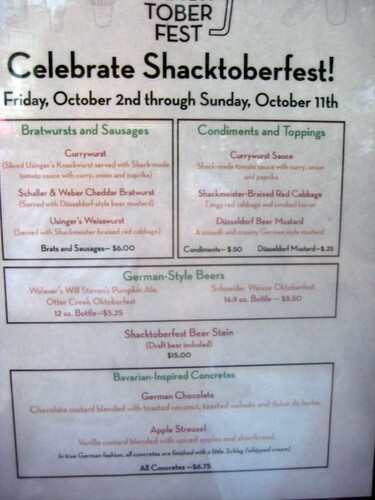 I knew all was well in the world when I got there and saw that Shacktoberfest had been saved! Friday, October 2nd (next week!) will make the opening day of fall and this time, shock of shocks, Wisconsin is representing alongside a New York institution. Yes, Danny Meyer is using Usinger's and Schaller and Weber on this year's menu. 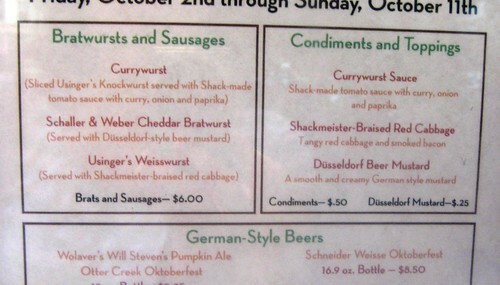 Out are the andouille sausage, the Polish sausage, and the Sheboygan-style beer-soaked bratwurst; in are a Currywurst, a Cheddar Bratwurst, and a Weisswurst topped with red cabbage. Oh yeah. 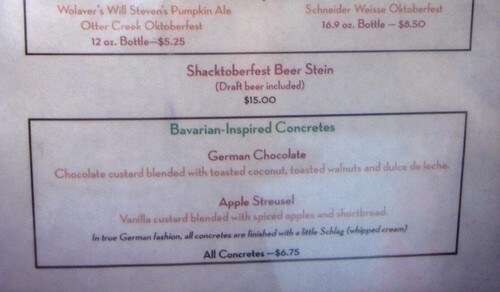 To drink, you can choose between Wolaver's Will Stevens' Pumpkin Ale, Otter Creek's Oktoberfest, Schneider Weisse's Oktoberfest, or, for $15, you could just get a whole stein of beer. Awesome. Lucky for us the desserts will be relatively the same, that is, delicious. Mayhaps we'll see the elusive Apple n' Honey or Pumpkin Pie Concretes?! The smart money's on Serious Eats: New York to bring you full opening-day coverage; until then, you'll just have to drool over their 2008 report. Alright, Usinger's! One of the great reasons to live in Milwaukee! Wowwww, ok I'm totally gonna be there!